Deck of cards by Murphy's Magic Supplies Inc.
$9.95 In stock. Order in the next 1 hour, 41 minutes and it will go out today! In stock. Order in the next 1 hour, 41 minutes and it will go out today! True beauty is natural and elusive, much like the fox. Inspired by our love of nature, Fox Targets Playing Cards embraces an authentic, raw beauty that reflects the allure of the rugged outdoors. Pixel by pixel, hand-crafted artwork art-directed by Jason Brumbalow and illustrated by Lance Miller. 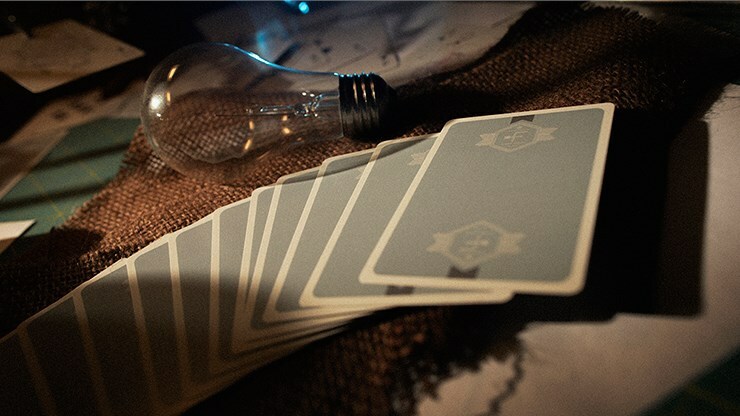 Masterfully printed by the Expert Playing Card Company on a premium stock and crafted with a smooth, slipstream finish. All that glitters is not gold. True beauty is just knowing where to look. Murphy's Magic Playing Card Co, is proud to present: the Fox Targets. 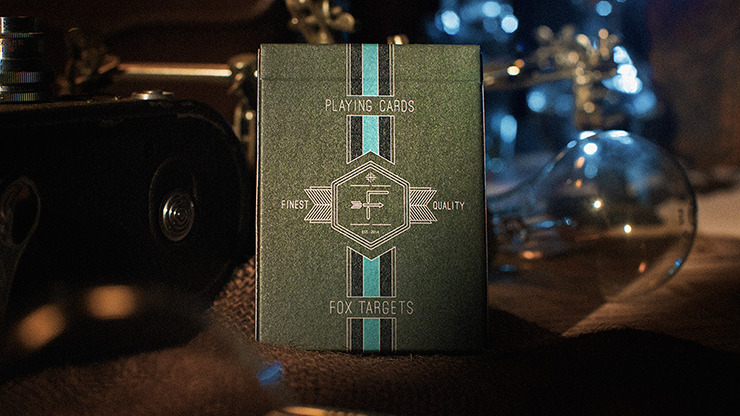 The Fox Targets Playing Cards exude sophistication and class from the moment you take off the shrink wrap. It has a matt forest green tuck box, with a very stylish design on the front, the vertical series of stripes dominating the overall look. The back of the tuck box has a ornate illustration in which the Fox Targets monogram is central, consisting of a letter F, with an arrow through the middle to indicate a T. Small details, like ornamentation on the tuck flaps, especially the foxes on the upper flap, all confirm an initial impression of quality, without needing to resort to bling like gold foil accents. Various symbols on the corners generate interest, like a campfire, arrows, ax, and tent, while the overall picture suggests an outdoors scene, which is no surprise given that this deck was inspired by a love for nature, and the rugged beauty of the great outdoors. Much of the artwork is camping oriented, and pictures the golden hour when the sun sets, which is the one time foxes can become visible hunting targets. But there's also deeper meaning behind the symbols, and the designer has explained that the fire represents the fire needed in one's heart, the tent represents the need for us to build a structure and home; everything is carefully thought out. 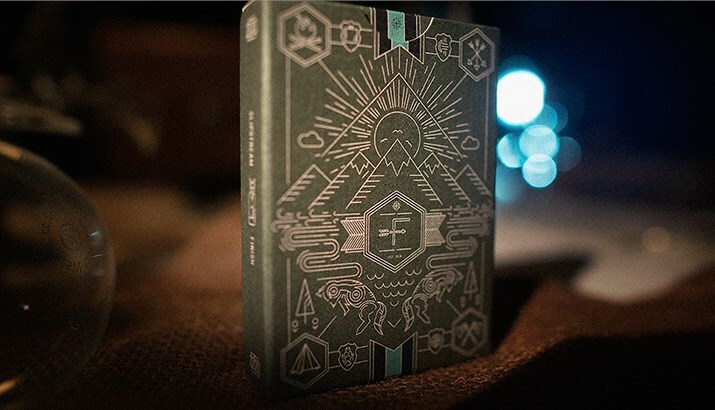 The artwork was illustrated by card artist Lance Miller, under the direction of Jason Bumbalow - both well known names for those well acquainted with the world of playing card design. Lance's interest and involvement in magic began in childhood, and in later years he chose to go into the world of art design for the magic industry. 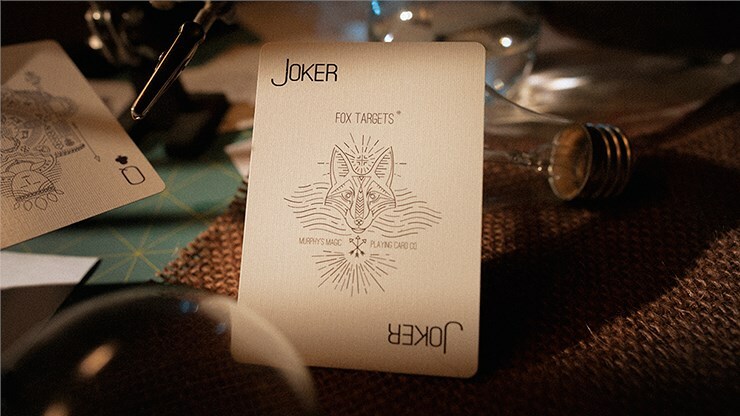 The collaboration and idea for this particular deck began when Jason found a vintage hunting target from the 1920s that had a fox pictured on it. This led to the idea of using concentric circles like the one inside the fox on the tuck box, and the design style used for the court card figures' hair. Once the deck is in your hands, everything about it looks and feels professional and classy. The card backs are a soft green grey that doesn't overstate itself, and there is a mirrored design that incorporates the Fox Targets monogram. I love this look. It's common to see decks with horizontal or vertical stripes, but to just have a partial stripe to the border gives the impression of a badge or medal of honour, and adds to the style. The colour of the face cards is slightly off-white, matching the borders on the backs, to give the entire look an environmentally friendly touch. 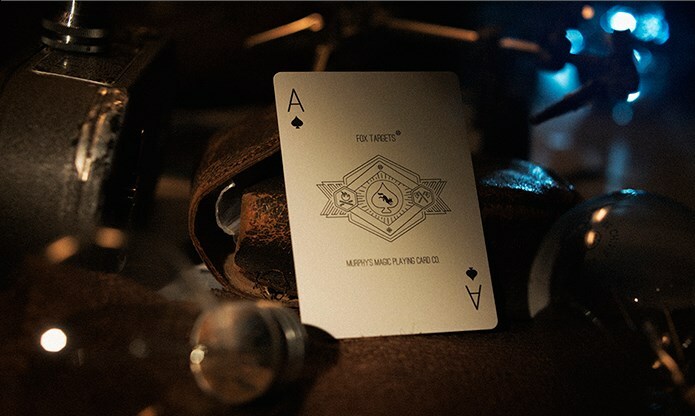 The Ace of Spades, a signature card for most decks, has a beautiful design which encloses a tiny fox within the spade pip, and is surrounded by the campfire and axe logo in a stylish black and white figure. The court cards are line drawings, black in the case of the spades and clubs, and two tones of red in the case of the hearts and diamonds. These feature illustrations of native Americans, many in ceremonial war dress, and armed with hatches and arrows. Lance Miller has poured hours of work into designing these images, with each court card involving on average an incredible 25 hours of time to illustrate - and that's before the process of digital remastering even begins! This means that over 250 hours have gone into the illustration process alone, while a card back typically involves over 80 hours. The designs involved countless iterations and designs in order to produce the beauty you see here. According to Lance, an entire deck like this takes more than 400 hours of work! And there is certainly a lot of detail - e.g. the Queen of Hearts has a nod to the Run deck's Joker at her top left shoulder. The number cards are absolutely exquisite in every way. To begin with, the pips are completely custom, and I especially love the unusual fire-like shape given to the diamonds. The spade pips are influenced by the same shape. They were hand-drawn by Lance Miller, and then digitized - so they are like no others that exist! All the pips are placed on the cards in a customized orientation that adds to the custom feel and a sophisticated look. The indices use a very thin font that confirms the look of elegance. To complete the deck, we have two matching Jokers, with our friend the fox again featuring prominently. This deck was printed in Taiwan by Expert Playing Card Company, in their crushed stock. The tuck box calls it "Slipstream Finish", but it feels identical to EPCC's Classic Finish. It handles superbly, and the edges have a outstandingly clean cut, superior to USPCC decks. USPCC was originally intended to be the publisher, so I'm glad that the change was made, even if it was last minute. But there's also a mysterious puzzle built into the deck. In an interview, Lance Miller revealed the following: "I won’t be upset if people don’t figure it out right away or ever for that matter. I wanted to create something that would last throughout time; that people might pick up 25 years from now and still be trying to solve. There are clues buried throughout all of the artwork and the entire deck itself is the puzzle. I almost hope no one ever solves it and that it brings many years of adventure to those endeavor to work on it." 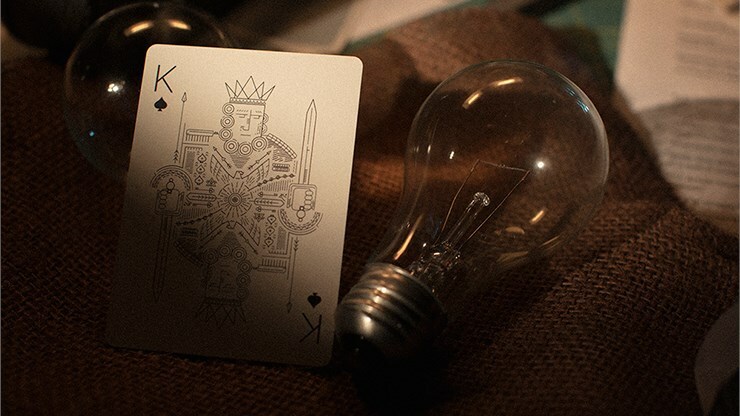 The promo video for the deck ends with a shot of the Ace of Spades and the voice-over: "All you have to do, is know where to look." Is that where the hunt begins? Perhaps. Lance gave a couple of other clues in a video here where he discussed the Fox Targets deck, where he said something to this effect: "Every single card has a story. Every story makes a greater story. I want to challenge you to see if anyone catches it. I gave so many clues, and it's not about me or any individual in particular. But it's about the deck, and the entire deck is a family - I will give you that!"